We are pleased to make available, a new body of work by Helen Sear. The Diviner series, made over the course of two years, depict willow trees at the edge of the Lac de Cercey in France. The thick fibrous tap roots of the trees are laid bare, resulting from a receding water level. The tree roots reminded the artist of the ‘skirts’ or hooped dresses—guardainfante—of the Spanish court painted by Velasquez, and with this in mind, the work is a simultaneous exploration of display/decoration and camouflage. Sear’s authorial intervention, evident elsewhere across her artistic practice, is employed here both physically and in the manipulation of the photograph itself. Each of the individual trees were decorated with wild flowers growing at the site. The use of the duotone color reinstates the past water level, and also refers to older methods of adding tints, dyes and filters to black and white photographs. Each photograph is titled with the name of a mythological goddess associated either with willow trees or water. 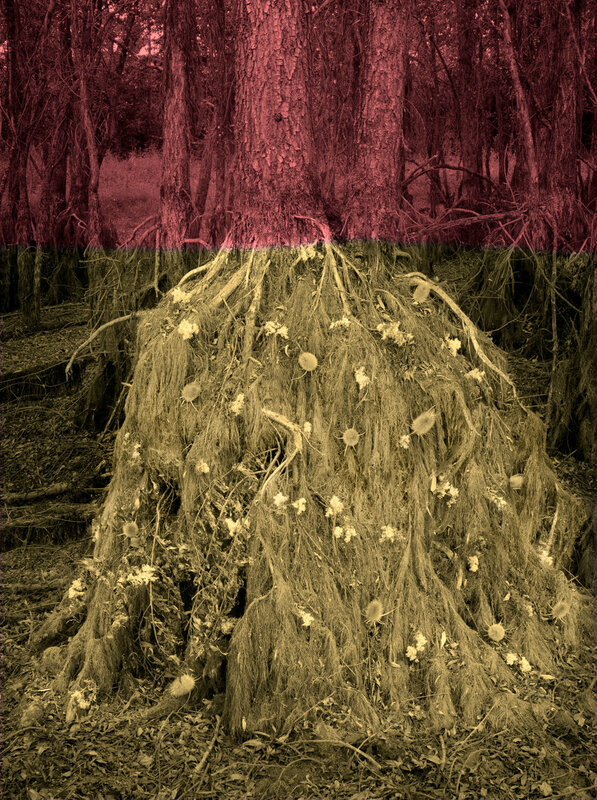 “In my imagination the decoration of these roots will lure the water back, in the same way that a Bowerbird decorates its nest to attract a mate. It is often the case that the Bowerbird will select a single color to decorate the nest with. Where the guardainfante dresses camouflaged illicit pregnancies, it has been suggested the the male Bowerbird has a higher success rate in mating, when the objects he arranges have a strong optical illusion or constructed perspective”.—Helen Sear. The Diviner series is available as follows: Archival Pigment Prints | 55 2/5” x 41 3/10” | Edition: 5+2AP.